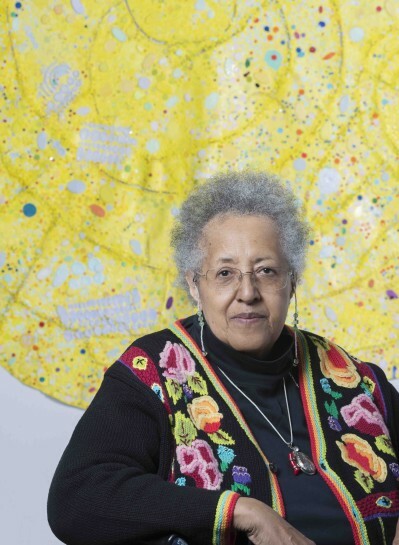 Victoria Miro is delighted to announce representation of US artist Howardena Pindell in collaboration with Garth Greenan Gallery, New York. The first solo exhibition of works by the artist in the UK will be held at Victoria Miro Mayfair in June 2019. Pindell is celebrated for employing unconventional materials such as glitter, talcum powder, even perfume, in her work and for rendering visible traces of labour, such as obsessively affixed dots of pigment and paper circles made with a hole punch, or canvases cut into strips and sewn back together, which signify wider, metaphorical processes of deconstruction and reconstruction. Trailblazing early works include Video Drawings, shown in the inaugural exhibition at P.S. 1 Contemporary Art Center in Queens, which led to a long series of works that feature her drawings superimposed over sporting events, news broadcasts and televised elections; and Free, White and 21, 1980, a video in which the artist plays herself and, wearing a mask, a white woman, whose conversation relays Pindell’s own experiences of racism. Her ravishing paintings of the 1970s, created by spraying paint through a template, prefigure what is now regarded as her signature aesthetic, in which colourful paper circles are meticulously affixed to unstretched canvases.